Coleridge nailed this one. I have enjoyed the delicious warm indoors of my studio while looking out on the winter light throughout the day. 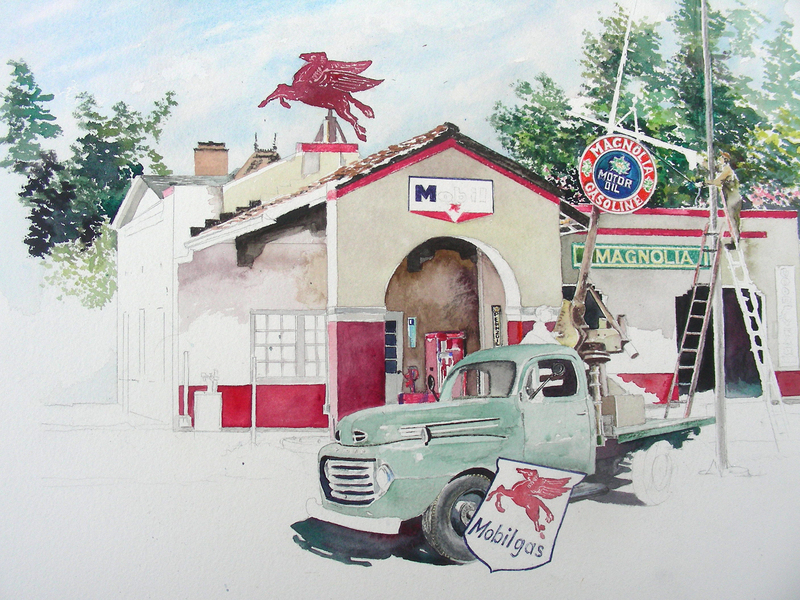 This painting is a close study of the transition of a 1950’s gas station from Magnolia to Mobilgas. 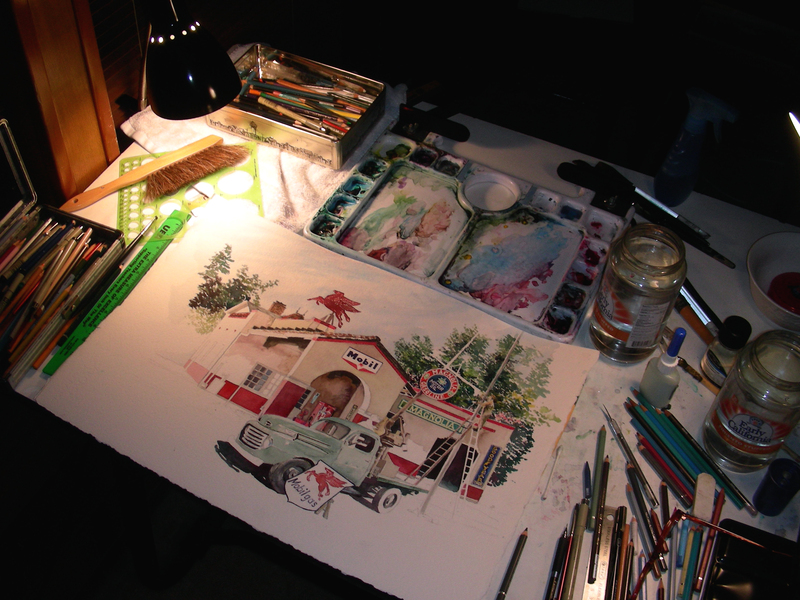 I’ve had such fun researching the signage, color schemes, advertising, architecture and vehicles of the era, and the longer I work on this, the more I recall my own childhood (by the way, I call my company Recollections 54 because it is my birth year, and I enjoy painting memories from that era). My website is http://www.recollections54.com. I have a Sinclair station on the front page of that site, a site that has been restored, located on McCart Avenue in Fort Worth, Texas. It looks like I’ll return to school tomorrow after a glorious four-day weekend. I’m sorry to leave this painting schedule I’ve enjoyed so much. Every sentence is the result of a long probation. But sometimes when I was starting a new story and I could not get it going, I would sit in front of the fire and squeeze the peel of the little oranges into the edge of the flame and watch the sputter of blue that they made. I would stand and look out over the roofs of Paris and think, “Do not worry. You have always written before and you will write now. All you have to do is write one true sentence. Write the truest sentence that you know.” So finally I would write one true sentence, and then go on from there. Writers inspire me as an artist. They have for years. I feel their struggle as they grapple with words just as I struggle, grappling with images. Today is the fourth consecutive day of painting in the studio for me, and fatigue is trying to set in. I know that is true when the breaks I take for household chores become attractive and I find more tasks to perform. Sometimes it is hard to keep the artistic juices flowing, and I am always grateful when a kindred spirit reaches me through the printed word. Thoreau wrote something in a Journal that I read and posted previously and returned to this morning to re-read and write in my own journal. His comment led me to recall a similar sentiment from Hemingway during his early Parisian days as a struggling writer. “Every sentence is the result of a long probation,” muses Thoreau. 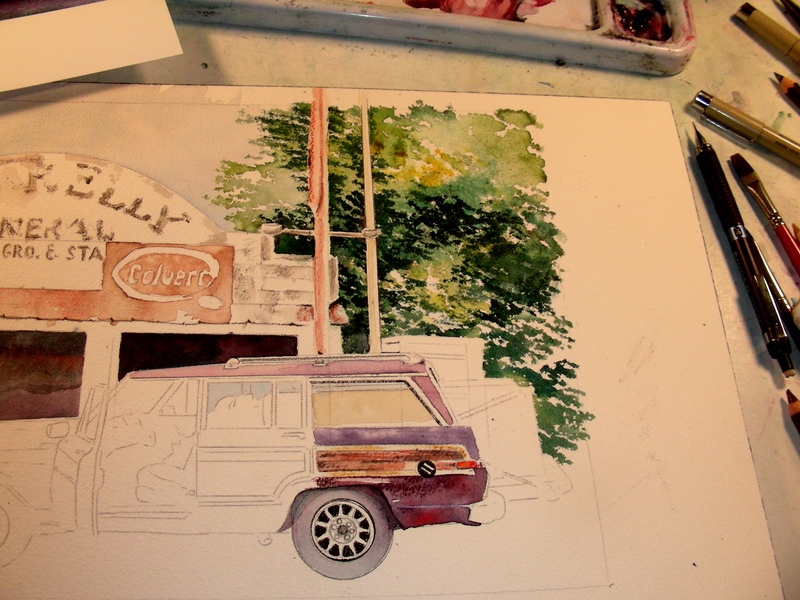 So also is every brushsroke of a watercolorist. Currently working on an 8 x 10″ piece, I feel a bit of a squeeze, knowing that brushstrokes have a much smaller stage and are more easily exposed than when woven into an 18 x 24″ composition. It is in these small pieces that I remind msyelf of the importance, the strength, the expression of a single stroke, and follow up with the realization that I can do this. I have done this for years, and will again today. Make each stroke direct and true, as Hemingway did each sentence. Realize, like Thoreau, that I have a long history in each stroke, a long regiment of training and rehearsal. This is not new. I just needed a jolt from the writers. I am grateful for them today. And grateful for this day, this space, this time. I was given the gift of a school closure last Friday. I rose around 5:30 a.m. or so, and put in somewhere between twelve and fourteen hours watercoloring in the studio with genuine bliss. Saturday I arose around the same time, and though I didn’t have quite the same energy, I nevertheless pushed myself and painted most of the day. Sunday I slept a little later, but was still up around 8:00, and divided the day between painting and preparing for Monday’s classes. Then came the evening announcement–school closed again Monday! Wow. Laying aside the school preparations, I have returned to the studio to do some more work on commissions that are due over the Christmas holidays, with an eye toward rising early again Monday morning to spend a fourth consecutive day in the studio, ever grateful for this string of studio days. Making art, to me, is genuine bliss. The world is filled with people who were given great natural gifts, sometimes conspicuously flashy gifts, yet never produce anything. And when that happens, the world soon ceases to care whether they are talented. Even at best talent remains a constant, and those who rely upon that gift alone, without developing further, peak quickly and soon fade to obscurity. Examples of genius only accentuate that truth. Newspapers love to print stories about five-year-old musical prodigies giving solo recitals, but you rarely read about one going on to become a Mozart. The point here is that whatever his initial gift, Mozart was also an artist who learned to work on his work, and thereby improved. In that respect he shares common ground with the rest of us. Artists get better by sharpening their skills or by acquiring new ones; they get better by learning to work, and by learning from their work. They commit themselves to the work of their heart, and act upon that commitment. So when you ask, “Then why doesn’t it come easily for me?”, the answer is probably, “Because making art is hard!” What you end up caring about is what you do, not whether the doing came hard or easy. Life may have been more pleasant for me in the past, had I learned this lesson earlier. At this stage, I find more satisfaction with making art than ever before, I suppose because I no longer obsess over whether or not I am any good, whether or not I’ll be remembered, whether or not I am making a contribution to the art world. I just love the work now, and more often than not, like the results of what I do. But even when I crank out a bad piece of art, I can merely toss it aside and move on to the next. And when a work doesn’t go well, I no longer have to finish it. I can quit, and move on to the next attempt. For years and years I groused over whether or not I had talent, whether or not I was a “good artist.” Somewhere along the way, those albatrosses fell from my neck, and I can stand straighter now, taller, and paint with more confidence. I love making art. I love studying art. I love looking at other people’s art. I’m glad I finally got to this juncture. I’m glad to find peace with my art. 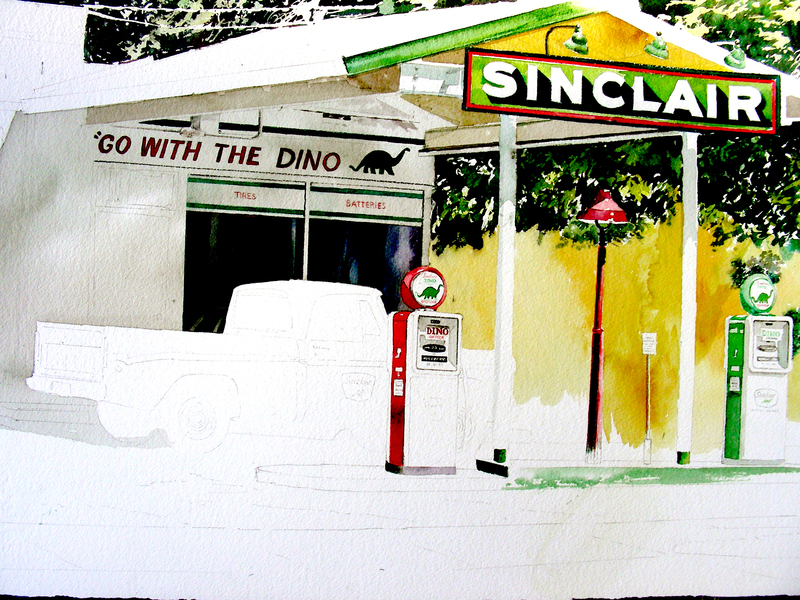 I have laid aside my large watercolor of the Coca-Cola sign and vintage gate for the time being, and decided to begin a new piece today. My output tends to be much better when I have several pieces generated simultaneously, and lately I have gotten away from that. Years ago, at a hotel conference, gallery owner Jason Horejs seized my attention when, addressing the group of artists, asked the question: “Just how prolific are you? How many works do you generate in a year? That is all a gallery owner wants to know.” By that time I was lucky to put out ten-to-fifteen watercolors a year, blaming my full-time job as a school teacher for my not being more prolific. 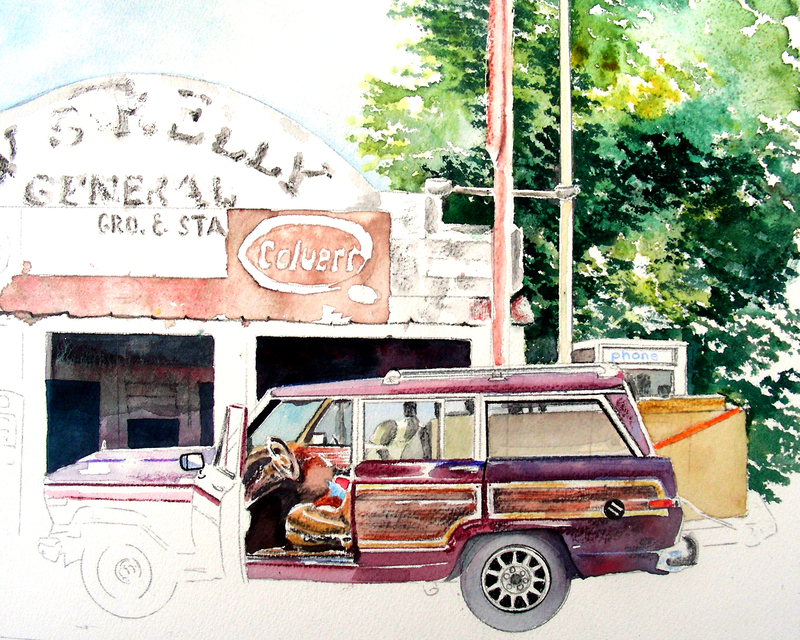 Since that day, I have averaged over a hundred watercolors a year, and feel much happier about my growth as an artist. I have always been inspired by the flood of work that poured out of creative persons of the twentieth century, particularly Neil Young and Pablo Picasso. Those men never seemed to quit. I have always wished to know that spirit of drivenness. 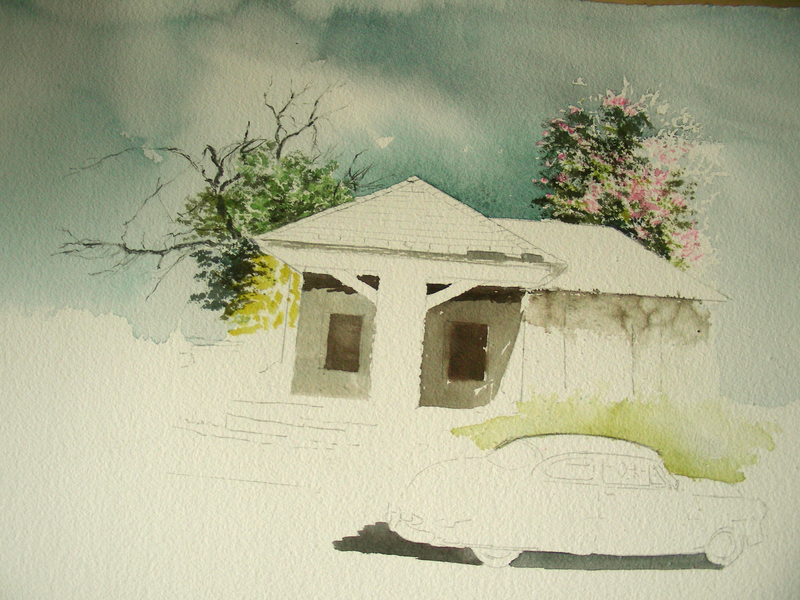 I have been looking at photos taken about a month ago of an abandoned service station in Archer City, Texas, a composition I have already done once as a quick 8 x 10″ piece. Going back through my archives, I also pulled a photo I took of a restored Hudson at an auto show several years back in Weatherford, Texas. I just finished reading Why Kerouac Matters: The Lessons of On the Road (They’re Not What You Think) by John Leland. My imagination soared as I recalled Dean Moriarty saying “Oh man, that Hudon goes!”. Since I read that line several years back, I’ve wanted to paint a Hudson from that era. So, here is my beginning. I took the gas station photo on a scalding hot, 100-plus-degree day. Looking at the photo, I decided not to put in the pasty white sky often found on such days, but a somewhat darker, stormier one, a sky that I hope would set off better the dead trees mixed with the live ones, as well as the crepe myrtle tree rising behind the building. The Hudson is going to be bright green, and I’m looking forward to rendering it. All in good time. I’ve lost my light for the day so must content myself now with reading and waiting for tomorrow’s light to return. I think I hear Thoreau’s Journal whispering as a muse to me, from the dark corner of my studio. My artist friend from Canada, Nancy Trottier, continues to nurture me as I hack my way through the technological thicket. I complained yesterday online that I did not know how to convert PDF to JPEG. I awoke this morning with detailed instructions in an email from Nancy, and within two minutes, the deed was done. Thank you, Nancy! You’re always showing me the way! 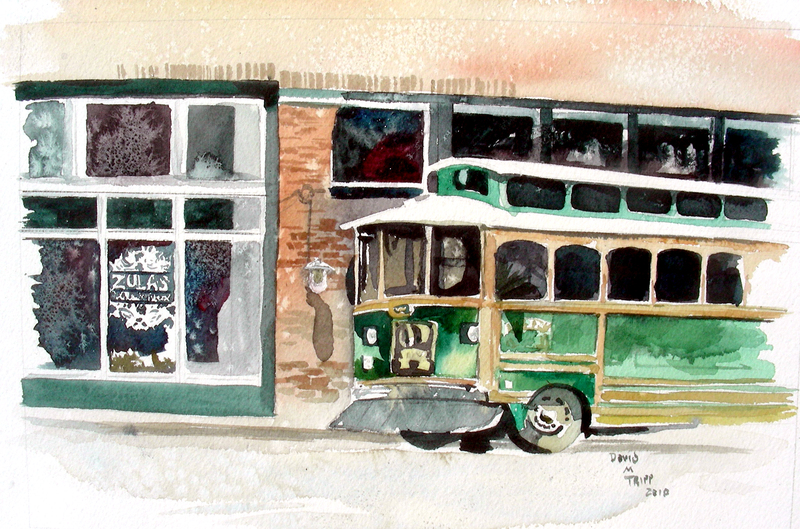 A graphics design artist from Fort Wayne, Indiana surprised me with an email Sunday, requesting to use my watercolor of a trolley car that I did en plen air during the summer of 2010. He was designing the cover of a weekly magazine for an arts fundraiser involving a trolley tour of the museums in the city. 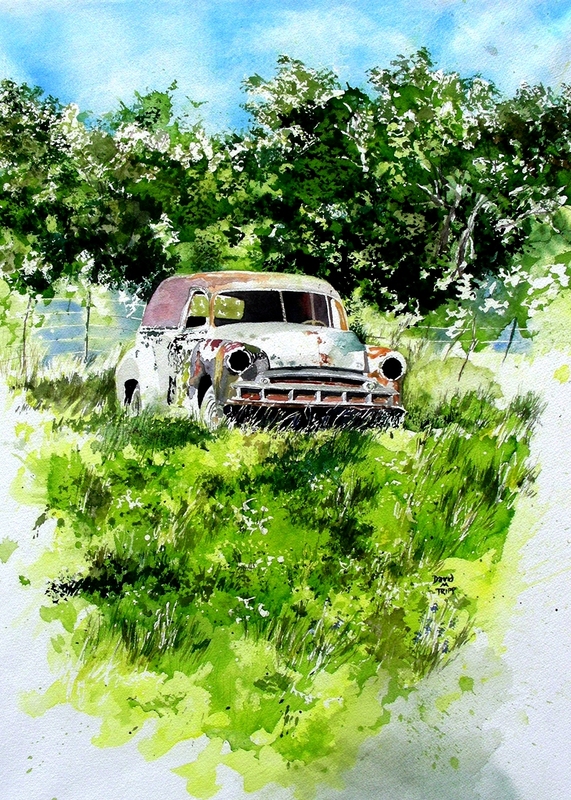 I’m pleased now to post a photo of the magazine cover, and happy once again to have a piece of my art published. I have never travelled to Fort Wayne, or even entered the state of Indiana for that matter. But I’m amazed at how art blogging has opened new frontiers for me, and allowed me to meet more people as well as get my art out to a broader audience. Thanks for reading, and thank you again, Nancy. The blogging life of the artist has taken interesting turns of late. 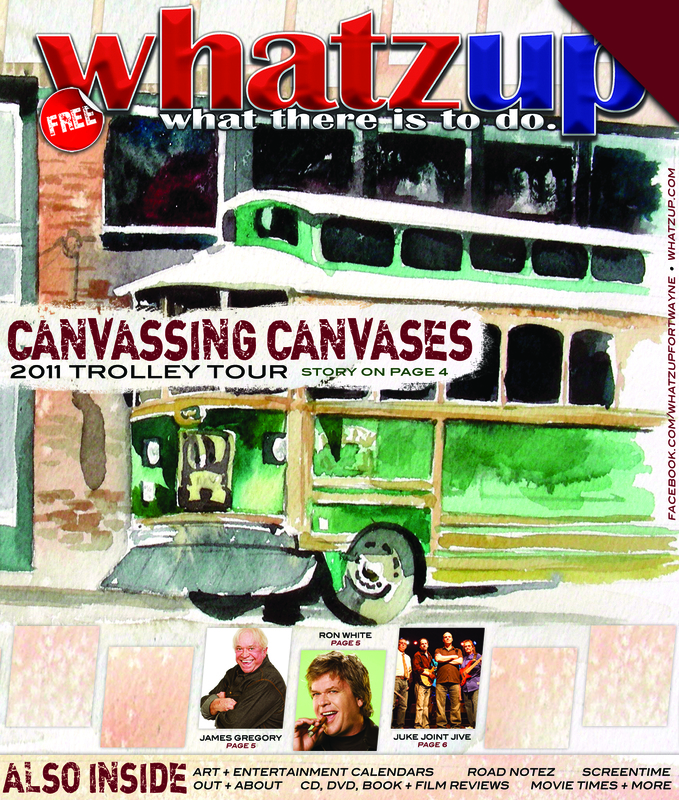 This is a trolley car that had been parked on the square in Waxahachie, Texas two summers ago (2010). 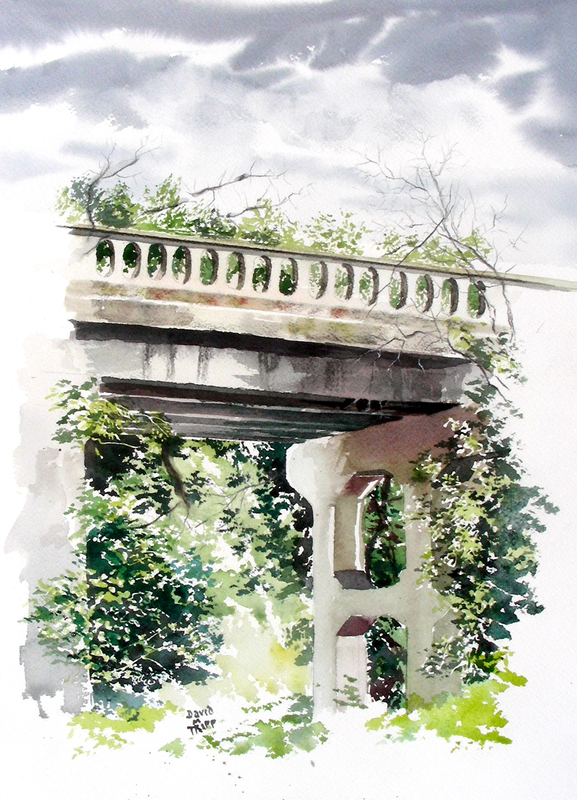 I painted it during a “Paint Historic Waxahachie” event that featured 55 plein air painters from the surrounding areas. The eight-day competition spurred the creation of hundreds of paintings. This one pictured was one of nine I painted during that eight-day cycle. Yesterday I received an email request from a graphics design artist working for the city of Fort Wayne, Indiana. He was requesting permission to publish this on the front of an advertisement for an arts fundraiser involving an arts trolley tour around the local museums. The publication is giving me credit for the art and publishing my website. I was all-too-glad to grant permission. The cover page has been sent to me, but alas, it is in PDF and I have not found out how to convert PDF to JPG unless I pay for the service. My attempts to publish the PDF photo on this blogsite have proved futile. At any rate, I have the magazine cover saved on my flash drive, and have been admiring it all day.